Collecting all 96 issues of Ron Bennett’s indispensable 1960s UK fannish newsletter Skyrack, published from 1959 to 1971. Greg Pickersgill organized the transcription of the printed copies as an online archive in 2006. This ebook version has been corrected and tidied throughout, and includes a new foreword by fan historian Rob Hansen, Greg Pickersgill’s web archive introduction, the spoof front-page stories from two alternative issues of Skyrack produced with a print run of one copy sent only to the hoax victim, and four parody newsletters (three Skyhacks and one Skyreck Newslitter) produced by other fans. In an afterword first published in Mimosa #22 (June 1998), Ron Bennett himself looks back on the Skyrack years and explains the title. First published as an Ansible Editions ebook for the TAFF site on 1 December 2017. 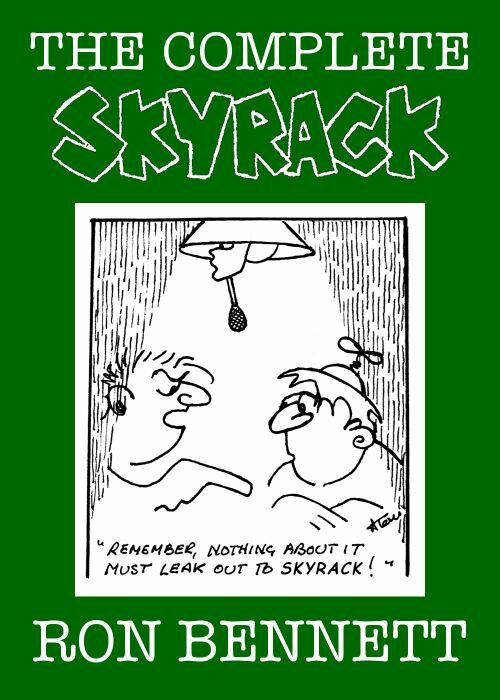 The cover design features the Skyrack masthead logo by Eddie Jones and a cartoon by Atom (Arthur Thomson). 218,000 words.